Roop Verma’s musical universe is interesting in many ways and is certainly worth getting to know. The music on the CD, Chetna (Consciousness), is clearly based on the Indian music tradition (the raga) which he masters with authority and great musical empathy. He plays on a Sitar, the Indian stringed instrument which is a further development of the Veena, considered to be one of the first stringed instruments in the world. The Indian music tradition today contains elements that can be traced back several thousands of years; this says a lot about how varied and profound this music is, both on a spiritual and a musical level. The distinction between Roop Verma’s music and that of traditional Indian music is heard most clearly on the album’s first track, “Raga Kiran Madhvi”, which lasts 40 minutes. As a listener, one is taken on an inner journey, guided and composed by Roop Verma. The Raga is made up of three parts: “Alap” which is slow and meditative, “Jor” which is medium tempo and ends fast, and the last “Jhala” where the tabla (Indian drums) are introduced by Subrahash Sarkar. The Jhala starts with a medium tempo and ends with a fast and intense finale. 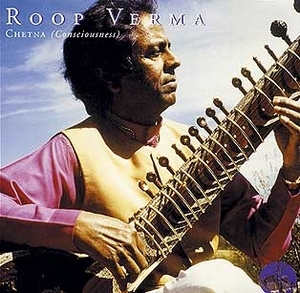 Roop Verma may not yet be counted as one of this century’s greatest sitar masters, on a level with Ustad Vilayat Khan or his master teachers Ravi Shankar and Ali Akbar Khan, maybe because his goal hasn’t just been to become a virtuoso of his instrument, but mainly because his interest in being a high status performer so far has been superseded by his interest in Nada yoga and on how music can influence the human psyche. This gives his music an extra dimension and you a feeling of being in “safe hands”, especially if you seek the meditative in the music.